I think pretty much all Michigan fans, me included, were thrilled with last weekend's victory against UConn. Expectations were all over the board in terms of well Michigan would do in this game. Nationally, the Wolverines was pretty much off the radar for most. No one really knew what to expect from this team, especially this offense. Michigan was only a 3 point favorite...basically you get 3 points for being the home team...so it was a push in the expert's eyes. So when Denard Robinson came out and set the field on fire with his amazing speed and suddenly deadly throwing ability, Michigan fans were pinching themselves by the middle of the 2nd quarter when the score was 21-0. The national media also took notice...some, like Doug Lesmerises from the Cleveland Plain Dealer ranked M as high as 8th in their week 2 top 25 ballot [Via MVictors]. High praise from the Buckeye state...a little too high. But why shouldn't Michigan fans be happy? The last time this team looked good was in the first half of the Illinois game on October 31, 2009...just before Roy Roundtree was tripped up just shy of the end zone, and we failed to score with 4 tries from the 1 yard line. When that happened, the proverbial wheels fell off the season and we crashed head-first into every Big Ten team left on our schedule. The last time we saw Michigan play, tOSU fans were doing their retarded O-H-I-O chant in our stadium. So who's to blame Michigan fans for going crazy over a win against UConn? 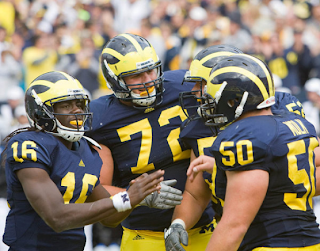 Wolverine fans were desperate to see something resembling life from this team. But what we saw last weekend was more than just a blip on the radar...it was a full-force offensive attack that made the Big East's best up-and-coming team look like they forgot how to play football for the 36 minutes that Michigan possessed the ball on Saturday afternoon. One thing I can tell you about UConn is that those might be the best linebackers we play all year in Scott Lutrus and Greg Lloyd. While we really don't know how good or bad the rest UConn is until they play more games, no one can argue that Denard Robinson played the game of his life. In his first career start, he set the school's QB rushing record, and became the #1 ranked player in the country in total offensive output with 383 yards. He was named the Big Ten offensive player of the week and he was a worldwide top trending topic on Twitter for Saturday. It was truly one of the most dominating performances by a Michigan QB we've seen in a long time. Of course, much of the love has to go out to the play of the O-line. They really showed up in week 1. We finally got to see what a healthy and experienced Michigan line looks like in the Rodriguez offense. If you're a defensive coordinator for the 11 teams left on our schedule, you're cringing at the thought of Denard Robinson lined up behind David Molk, Stephen Schilling, Mark Huyge, Patrick Omameh and Perry Dorrestein. But as amazing as this opening win was...we've been right here before. And it didn't end well. Flashback all the way to 2009. Michigan had just become 4-0 with a clutch win against Indiana. We were ranked in the top 20 again. Tate Forcier had shown poise and moxie that was way beyond his years. He played the first 5 games last year with the confidence and leadership of a 5th-year senior. Michigan fans proclaimed "May the Forcier be with you!". "Forcier for Heisman" was being printed on t-shirts. The national media was claiming Tate the next big thing in college football. 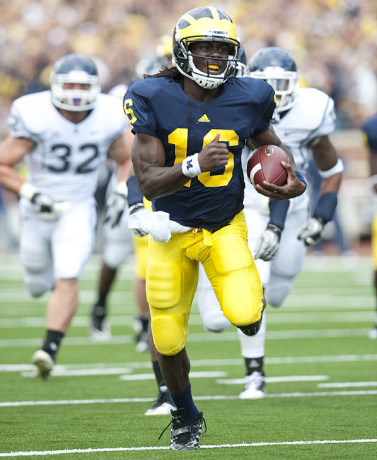 He was truly the toast of Ann Arbor during Michigan's start to the 2009 season. But then, for many reasons, the season began to slip. We lost to Sparty in OT, and then lost to Iowa the following week in dramatic fashion. We struggled with a young and inexperienced defense. We turned the ball over consistently. Injuries impacted our offensive line, QB and RB positions. Plus the Big Ten schedule was just tough. Being a young and inexperienced team, we floundered. So what did we learn from 2009? For me, I learned that impressive wins in September don't make a lick of difference when you can't win in October and November. Big Ten titles are won in those two months. In two years since becoming head coach, Rich Rodriguez has 3 wins against Big Ten opponents. 2 wins in 2008 (Wisconsin and Minnesota), and 1 in 2009 (Indiana). Basically, we all just need to calm down a little bit and get some perspective. I don't mean to say that we can't be excited and be proud of our great start...not at all. But let's keep things under control until we start knocking off real teams that matter. As strange as it sounds, I kept having this overwhelming feeling last year as I watched one Big Ten opponent after another take us out to the woodshed. And that thought was...just wait and see. I knew that there would be a time when Michigan would be back. I wanted to tell every Big Ten school to enjoy getting their licks against us while they could, because once things clicked for us, it would be on. I'm not bold enough to proclaim that 2010 will be that kind of year...but I am thrilled with what I saw in week 1. Our offensive line was just dominant. They played maybe one of the most complete games I've seen them play in years. If we can keep that up, stay healthy, and somehow keep our defense at least somewhat intact, then every team on our schedule is beatable. And yes, I'm looking at you tOSU.